Accuweigh recently supplied a concrete deck weighbridge featuring a semi-pit foundation to a waste management company in Queensland’s Wide Bay to weigh their waste carrying vehicles. 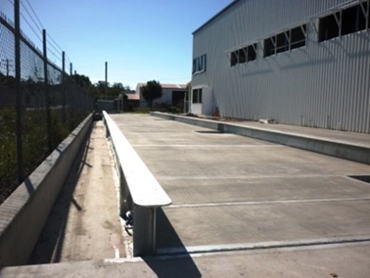 Supplied by Accuweigh’s QWM branch in Brisbane, these concrete deck weighbridges are ideal for heavy duty weighing applications due to the increased strength and rigidity of concrete. The weight of the concrete deck also adds significant mass to the weighbridge creating a more stable weighing structure that can resist weight fluctuations in windy conditions. Accuweigh’s concrete deck weighbridge is also ideal for installation in environments where daily temperature fluctuations can cause significant expansion and contraction of steel deck weighbridges. The large mass of the concrete deck acts as a buffer to moderate the amount of expansion and contraction of the steel beams leading to more consistent end stop clearances. Australia's weighing experts can provide good advice on selecting the most appropriate weighbridge model to suit specific applications. Accuweigh offers excellent product support across all mainland states through a network of eight branches.